There’s something about the post Christmas period and start of a New Year that prompts, in most of us at least (quick straw poll of the Go Modern team), a desperate feeling of needing more space. Or at least a big declutter. Or maybe we should have just got out more over the holiday! The great thing is that there’s no need to compromise on style to achieve more space. Lots of the brands we work with have used their creative energy to come up with some very clever and stylish products that will maximise your existing space and give you the cool, sleek, uncluttered look you dream of. 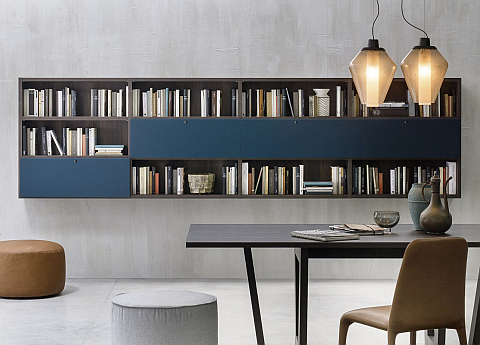 Quirky Italian brand Mogg creates lots of great furniture that makes us think differently about conventional design. These fab wall units (above), called DPI, have a slightly industrial look, which we love, and they’re modular/varying sizes. 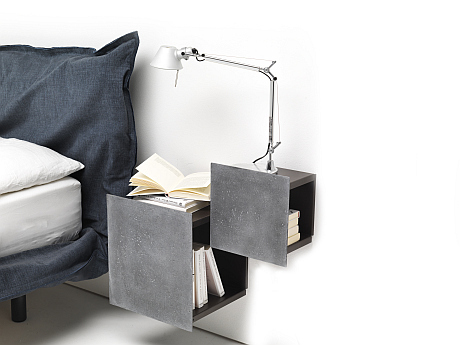 The styling here shows them used very creatively as a wall hung bedside table and book storage. And talking of books, we’ve got tons of them (even more since Christmas!). Like good friends you never want to part with… kind of. But what to do with them all if you don’t operate the ‘one in/one out’ system? 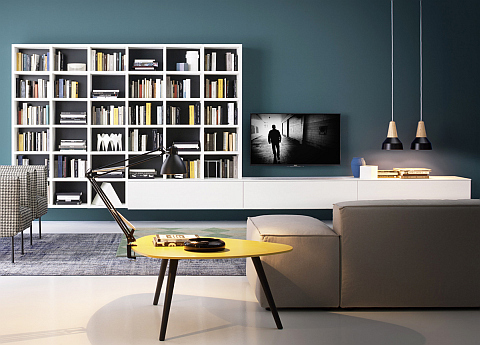 Novamobili are the people to ask – specialising in wall units (and some great wardrobes) that ooze Italian style. The Wall Unit/Bookcase 08 (above) has a very ordered, contemporary look with bookshelves split into individual compartments to help with the sorting, along with sleek, complementing drawers. Plus…all your TV cables, DVD systems, audio equipment, the whole lot, can be hidden away neatly in specially created channels and behind panels, so the dreadful electronic spaghetti cable mess need never haunt you again. Here’s another smaller version of the Wall Unit/Bookcase above, showing just how versatile this great system is. 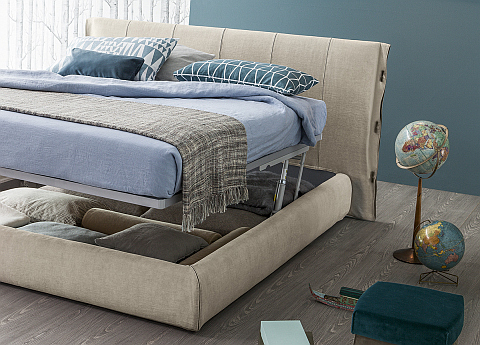 And dont under-estimate the amount of storage a good storage bed will give you. Bonaldo’s Cuff bed (above) is an uber stylish storage bed (with some very neat leather inserts on its headboard) and has what’s called a ‘Comodo’ storage base. This is where the whole of the top lifts up with the help of gas pistons. This means that not only will your bed stay made, always a big plus in our book, but you won’t have to shift any bedside furniture around before you can retrieve whatever it is you’ve stored. Anything to make life a tad easier! 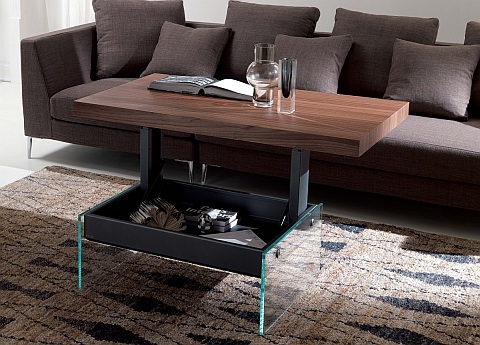 Ozzio are a young Italian brand who major in space saving, transformable furniture. From wall units that hide dining tables for eight (seriously) to cute coffee tables that have hidden storage and transform, like the one below, Bellagio, into a desk or something called a ‘dinette’ table. Great for TV dinners or a bit of sofa home-office working. PS – We’ve also got a winter sale on at the moment – so hop over and make the most of it!